Despite Property Values Rising - Are Aylesbury Apartments Just As Affordable As 10 Years Ago? Research shows that certain types of Aylesbury property are just as affordable today than they were before the 2007 credit crunch. Roll the clock back to 2007 just before the credit crunch hit which saw Aylesbury property values plummet like a lead balloon and the Aylesbury property market had reached a peak with the prices for Aylesbury property hitting the highest level they had ever reached. 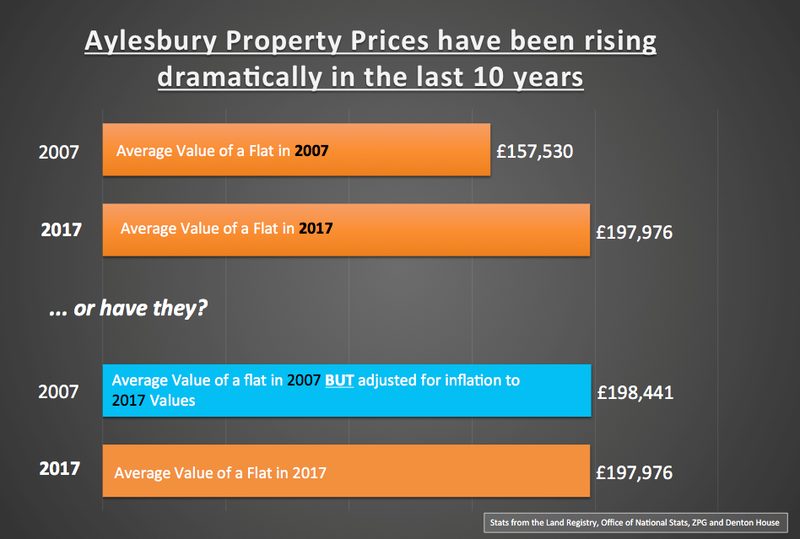 Between 2008 and 2010, Aylesbury property values lay in the doldrums and only started to rise in 2011, albeit quite slowly to begin with. Nevertheless, even though property values have now passed those 2007 peaks, my research indicates that Aylesbury property, especially flats/apartments, are now just as affordable as they were before the 2008 credit crunch (in real terms). Back in 2007, the average value of an Aylesbury flat/apartment stood at £157,530 and today, it stands at £197,976, a rise of £40,446 or 25.7%. However, between 2007 and today, we have experienced inflation (as measured by the Government’s Consumer Price Index) of 25.97% meaning that in real spending power terms Aylesbury apartments are 0.3% more affordable than in 2007. 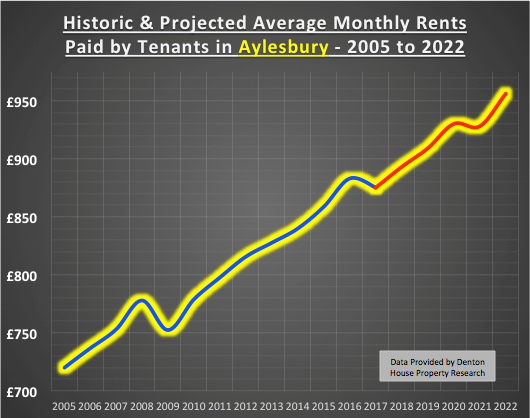 Looking at it another way, if the average Aylesbury apartment (valued at £157,530 in 2007) had risen by 25.97% inflation over those 10 years, today it would be worth £198,441 (instead of the current £197,976)… not much different in real terms. The point I’m trying to get across is that Aylesbury property is more affordable than many people think. Aylesbury first time buyers can get on the ladder as 95% mortgages have been readily available to first-time buyers since 2010. It really comes down to a choice and if Aylesbury first-time buyers can get over the hurdle of saving the 5% deposit for the mortgage on the property – they will be on to a winner, especially with these ultralow mortgage interest rates, a mortgage can be between 10% and 30% cheaper per month than the rental payments on the same house. So why aren’t Aylesbury 20 somethings buying their own home? Back in the 1960’s and 1970’s, renting was considered the poor man’s choice in Aylesbury (and the rest of the Country) a huge stigma was attached to renting. However, over the last 10 years as a country, we have done a complete U-turn in our attitude towards renting - meaning that many people find renting a better option and a lifestyle choice. Saving the 5% deposit means going without many luxuries in life (such as holidays, every satellite movie and sports channel, socialising or the latest mobile phone – even if only in the short term) therefore instead of saving every last pound to put towards a mortgage deposit Aylesbury 20 somethings choose to rent. There is no denying the simple fact that over the next 10 to 15 years, the people who choose to rent instead of buy in Aylesbury will continue to rise. Therefore, everyone in Aylesbury has a responsibility to ensure that an adequate number of quality Aylesbury rental properties are safeguarded to meet those future demands. Interestingly, what I have noticed though over the last few years are the expectations of Aylesbury tenants on the finish and specification of their Aylesbury rental property. It was perceived that in the past, that what a tenant wanted from their Aylesbury rental property was moderately unassuming because renting a property was only a short-term choice to fill the gap before jumping on the property ladder. Before the millennium, wood chip wall paper and twenty-year-old kitchen and bathroom suites were considered the norm. However, Aylesbury tenants’ expectations are becoming more discerning as each year goes by. I have also noticed the length of time a tenant remains in their Aylesbury property is becoming longer (and this was backed up recently by stats from a Government Report), although I have noticed a tendency for many Aylesbury landlords not to keep the rental payments at the going market rates - maybe a topic for a future article for my blog? The bottom line is this … Aylesbury landlords will need to be more conscious of tenants needs and wants and consider their financial planning for future enhancements to their Aylesbury rental properties over the next five, ten and twenty years - e.g. decorating, kitchen and bathroom suites etc etc .. The present-day and future situation of the Aylesbury private rental property market is important, and I frequently liaise with Aylesbury buy-to-let investors looking to spread their Aylesbury rental-portfolios. I also enjoy meeting and working alongside Aylesbury first time landlords, to ensure they can navigate through the minefield of rental voids, the important balance of capital growth and yield and ensuring the property is returned back to you in the future in the best possible condition. 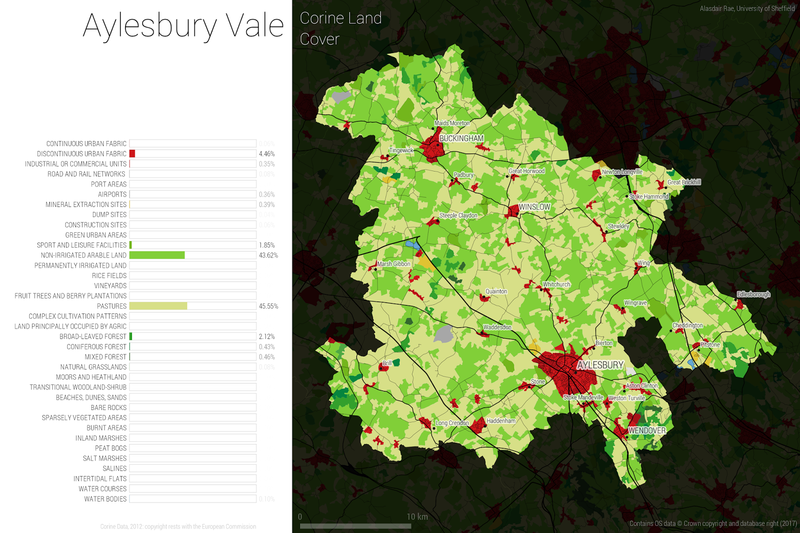 4.46% of Aylesbury Vale is Built on ... Building Plot Dilemma or Not? Well the fallout from the recent Budget is still continuing. I was chatting to a couple of colleagues the other day, when one said, “There isn’t enough land to build all these 300,000 houses Philip Hammond wants to build each year”. As my blog readers know, I always like to ask the important questions relating to the Aylesbury property market. 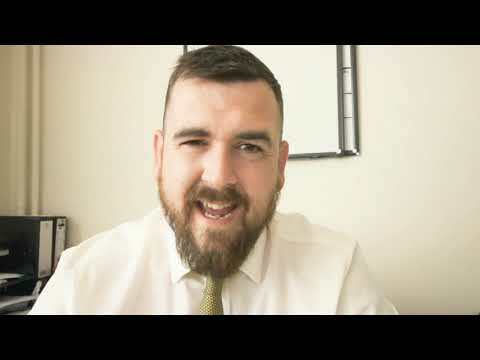 If you are an Aylesbury landlord or Aylesbury homeowner, this knowledge will enable you to make a more considered opinion on your direction and future in the Aylesbury property market. Like every aspect of all economic life, it’s all about supply and demand, because over the last twenty or so years, there has been an imbalance in the British (and Aylesbury) housing market, with demand outstripping supply, meaning the average value of a property in Aylesbury Vale has risen by 411.69%, taking an average value from £66,700 in 1995 to £341,300 today. 1. What proportion of the whole of Aylesbury Vale is built on? That surprised you, didn’t it! In the study, land classified as ‘urban fabric’ defined as land which has between 50% and 100% of the land surface is built on, (meaning up to a half might be gardens or small parks, but the majority is built on). ...the rest being made up of various other minor types such as airfields and forests, etc. Aylesbury and the surrounding areas are greener than you think! In fact, I read that property covers less of the UK than the land revealed when the tide goes out. The assumption that vast bands of our local area have been concreted over doesn't stand up to inspection. However, the effect of housing undoubtedly spreads beyond its actual footprint, in terms of noise, pollution and roads. The bottom line is Aylesbury people and the local authorities are going to have to put their weight into building more homes for people to live in. There is going to have to be some give and take on both sides, otherwise house prices will continue to rise exponentially in the future and Aylesbury youngster’s won’t be able to buy their own Aylesbury home, meaning Aylesbury rents and demand for private rented accommodation in Aylesbury can (and will) also grow. I miss the days of George Osborne as Chancellor, with his hardhat and hi-vis jacket. He must have visited every new home building site in the UK with his trademark attire! For the last few years, Philip Hammond hasn’t come close to even donning a ‘Bob the Builder’ outfit. However, with what appears to be a change in focus by the Tories to try and ensure they get back in power in 2022, they appear to have fallen in love with house building again with the Chancellor’s promise to create 300,000 new households in a year. Nationally, the number of new homes created has topped 217,344 in the last year, the highest since the financial crash of 2007/8. 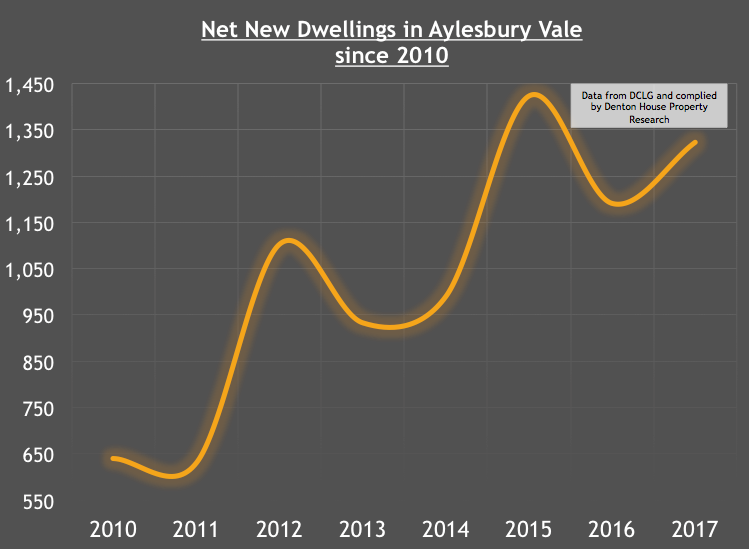 Looking closer to home: in total there were 1,323 ‘net additional dwellings’ in the last 12 months in the Aylesbury Vale District Council area, an increase of 106% on the 2010 figure. The figures show that 91% of this additional housing was down to new build properties. In total, there were 1,208 new dwellings built over the last year in Aylesbury Vale. In addition, there were 131 additional dwellings created from converting commercial or office buildings into residential property and a further 3 dwellings were added as a result of converting houses into flats. While these all added to the total housing stock in the Aylesbury Vale area, there were 19 demolitions to take into account. I was encouraged to see some of the new households in the Aylesbury area had come from a change of use. The planning laws were changed a few years back so that, in certain circumstances, owners of properties didn’t need planning permission to change office space in to residential use. With the scarcity of building land available locally (or the builders being very slow to build on what they have, for fear of flooding the market), it was pleasing to see the number of developers that had reutilised vacant office space into residential homes in the local council area. Converting offices and shops to residential use will be vital in helping to solve the Aylesbury housing crisis especially, as you can see on the graph, that the level of building has hardly been spectacular over the last seven years! The biggest question is, just where are the Government going to build all these new houses? Back to the main point though and the focus on the housing market by the Tory’s is good news for all homeowners and buy to let landlords, as it should encourage more fluidity in the market in the longer term, sharing the wealth and benefits of homeownership for all. However, in the short term, demand still outstrips supply for homes and that will mean continued upward pressures on rents for tenants. It’s now been a good 12/18 months since annual rental price inflation in Aylesbury peaked at 3.4%. Since then we have seen increasingly more humble rent increases. In fact, in certain parts of the Aylesbury rental market over the autumn, the rental market saw some slight falls in rents. So, could this be the earliest indication that the trend of high rent increases seen over the last few years, may now be starting to buck that trend? Well, possibly in the short term, but in the coming few years, it is my opinion Aylesbury rents will regain their upward trend and continue to increase as demand for Aylesbury rental property will outstrip supply, and this is why. The only counterbalance to that improved rental growth would be to meaningfully increase rental stock (i.e. the number of rental properties in Aylesbury). However, because of the Government’s new taxes on landlords being introduced between 2017 and 2021, that means buy-to-let has (and will) be less attractive in the short term for certain types of landlords (meaning less new properties will be bought to let out). Anecdotal evidence suggests, confirmed by my discussions with fellow property, accountancy and banking professionals in Aylesbury, that Aylesbury landlords are (instead of selling up on masse), actually either (1) re-mortgaging their Aylesbury buy-to-let properties instead or (2) converting their rental portfolios into limited companies to side step the new taxation rules. The sentiment of many Aylesbury landlords is that property has always weathered the many stock market crashes and runs in the last 50 years. There is something inheritably understandable about bricks and mortar – compared to the voodoo magic of the stock market and other exotic investment vehicles like debentures and crypto-currency (e.g. BitCoin). Rents in Aylesbury over the next 5 years will rise by 9.2%, taking the average rent for an Aylesbury property from £875 per month to £955 per month. To put all that into perspective though, rents in Aylesbury over the last 12 years have risen by 21.5%. In fact, that rise won’t be a straight-line growth either, because I have to take into account the national and local Aylesbury economy, demand and supply of rental property, interest rates, Brexit and other external factors. In the past, making money from Aylesbury buy-to-let property was as easy as falling off a log. But with these new tax rules, new rental regulations and the overall changing dynamics of the Aylesbury property market, as a Aylesbury landlord, you are going to need work smarter and have every piece of information, advice and opinion to hand on the Aylesbury, Regional and National property market’s, to enable you to continue to make money.